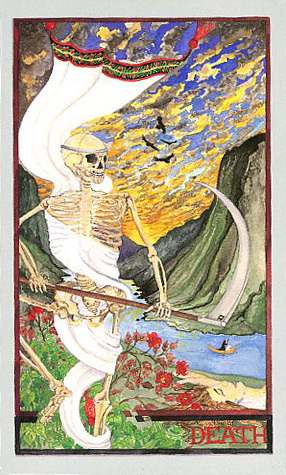 The Wheel of Change Tarot was originally published as a boxed set by Inner Traditions/Destiny in 1997, selling 12,000 copies. We have re-published the card deck in its own box, and the 366 page book has now been released separately, both as an eBook and as a print-on-demand version. The cards are printed on sturdy card stock with a nice finish, making them easy to shuffle. Also, the Color Wheel Card appears on the reverse side of each card, as it had originally been envisioned (in the first version, it was added as a 79th card in the deck instead). The deck is only available from us directly — to order, visit the Store. For ordering the companion book, visit the Wheel of Change Tarot BOOK PAGE. Domestic and international shipping rates for decks are listed on our Shipping Info page. 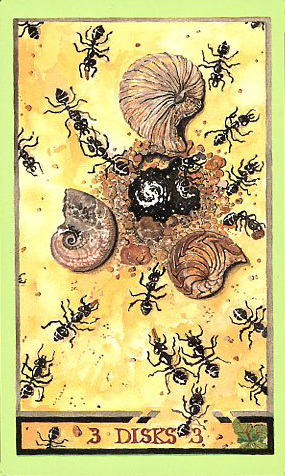 "THE WHEEL OF CHANGE TAROT is a brilliant, imaginative reconception of the traditional deck. Alexandra Genetti's interpretations are deeply thought out, based on years of research and meditation, ripe with both knowledge and sensitivity. Her paintings are beautiful, imaginative in conception, rich in detail, realized with great skill. Without losing the ancient magic of the cards, she includes modern imagery and multicultural heritages. A great introductory deck for new readers, her work will also give long-time students of the Tarot new perspectives and insights. I highly recommend it!" For more information on the Wheel of Change Tarot, take a look at the links in the list below. There are pages on the deck's structure and features, ordering information for the companion book, reviews, and examples of the book text - all with card images included.